House with 2 floors, area 110 m2, popular neighborhood, 5 minutes walk from the center of town and 20 minutes walk from laginha beach. Quiet, safe and familiar zone. 5 meters from the Unitel building, watched outdoors 24/7. 30 meters from the main avenue of Monte Sossego (Avenida da Holanda). 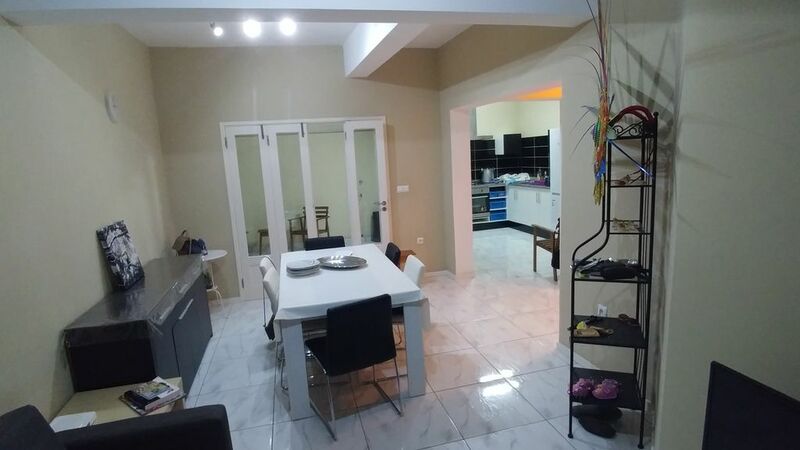 House completely renovated, equipped and furnished, ready to live. Three bedrooms, possibility of one of the bedrooms turn into office. Kitchen, living and dining area, 2 bathrooms and interior patio. Terrace on the house accessible and ideal for sunbathing. To enjoy your holidays or on a business trip with all the tranquility and comfort. At 100 meters from bars and restaurants (average fare of a meal less than 5 euros). Supermarket at 200m. I communicate fluently in Portuguese, French and English. Preferential rates for long stays. Casa cómoda para estancias largas, barata y con todo lo necesario . Very nice house in the Nice area of Monteseseggo! Shops and restaurants in the neighboorhood! Very nice house, Nice neighbourhood, Nice owners, good price. Everything you need is there. 10 min from city center and a 20 min walk from Laginha beach. Taxi's drive by all the time and cost 1,20 euro to Laginha. Around the corner (Boston) you can eat great Cachupa, Lagoste, chicken, hamburgers for 2 euro. Great place! I'm glad for you, i hope to serve you again. A casa é muito confortável e equipada com todas as comodidades. Localiza-se numa zona residencial muito calma e a 5 minutos do centro. O acolhimento foi muito simpático e atencioso. Nos é que agradecemos pela preferencia e confianca depositada.